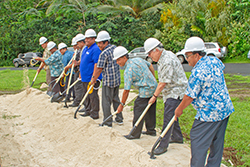 Palikir, Pohnpei—US, FSM, and Pohnpei officials gathered together this afternoon on the grounds of the College of Micronesia FSM to break ground for a long planned water project. Five years ago the water pipe extension from Sekere to Palikir was completed and bid proposals were solicited for another phase of a water project to extend the line from Palikir, Sokehs to Nanpei Memorial High School in Kitti. A contractor questioned the bidding process and filed a civil suit. The civil suit was recently dismissed. That process, along with legal access to some crucial pieces of land for the project, caused the roughly five year delay. The nearly $6.4 million project is set to begin as soon as mobilization of equipment and supplies is accomplished. The terms of the contract have established a completion date of two years from start of project until completion. Lyon Associates, Inc. long ago designed the project. ABCOR Engineering and Construction, Inc. will be doing the construction. The project is funded by a US Compact Infrastructure Grant and has recently been coordinated by the US Army Corps of Engineers and the fairly new Pohnpei Project Management Office.